Tuesday evening the monsoon trough axis was south of normal position, and the UAC over south Gujarat running into the Arabian Sea is now south of Saurashtra coast. Setting the conditions for re-activating the off shore trough along the west coast. Yesterday's UAC mentioned in vagaries also persists off the A.P. coast. I see the UAC persisting ( as a UAC) for a few days more in the same region. International MJO forecast models Forecasters have pushed the MJO in our region getting weak (date) to 3rd August. On checking various models, i summerised the weak phase to now commence from around 3rd/5th August. Previously, in the begining of June, vagaries had estimated, based on other models, the weak phase to beginaround 25th July. As the west coast trough remains partially active, average (normal) showers along the Mah.and Karnataka coast on Wednesday/Thursday, with light/moderate rains in Gujarat for Wednesday. N.Interior Karnataka may see some enhanced rainfall after Friday, assuming the off shore trough activates by then.Some heavy falls can move into the N.Karnataka region from Friday, as there is a possibility of an inland vortex forming. Some rainfall to continue Wednesday/Thursday, 27th/28th, in South interior Karnataka, and in coastal T.N./ Southern A.P. due to UAC. Rainfall sure to increase from Wednesday thru Friday in U.P. and Delhi. I see the precipitation moving away from the Sindh coast, from Wednesday, as the original system has weakened and moved west. Cloudy weather for Karachi next 2/3 days, with minimum precipitation. Seeing the situation as very fluid, i will not attempt to forecast beyond 2/3 days. I beleive Forecasts changes should be minimum to avoid confusion. See Mumbai Page for those interested in Mumbai weather (updated on Tuesday night). Pls update about Karachi rains, is the system fizzle out?? Again no rains in Nagpur/Vid. for last 4 days now. Any prospect of getting rains before the weak MJO arrives. The GFS continues to maintain Extremely heavy rains for Coastal Karnataka and then Konkan (including Mumbai) starting tomorrow. For Mumbai the heaviest falls are forecasted for Saturday and Sunday. It shows formation of a vortex at 500 mb right over Mumbai in its latest runs. The UKMET however does not believe any of this will happen and shows only moderate rains for Mumbai and Konkan till Monday of the coming week. As Rajesh has mentioned in his yesterday night's blog, we will have to wait and watch. The Monsoon trough by the way has now shifted North as compared to it's previous night's position, it will continue to move North as per the IMD. @svt - thunderstorm? I was on the road yesterday right from 7:00 pm till 10:30 pm 'snailing' my way across the city in trying to drop relatives at the International Airport. While there was heavy to moderate rain at various places from 7:30 pm till about 9:30 pm, I did not notice any thunderstorm anywhere i.e. no lightning or thunder. Did anyone else? what about the supposedly low pressure at west central bob?? heavy rains in mumbai over the weekend..!!!???? My own observations tell me that the Offshore trough has moved away from the shore due to the LOW over Saurashtra / Kutch, it will come back once the LOW moves west. 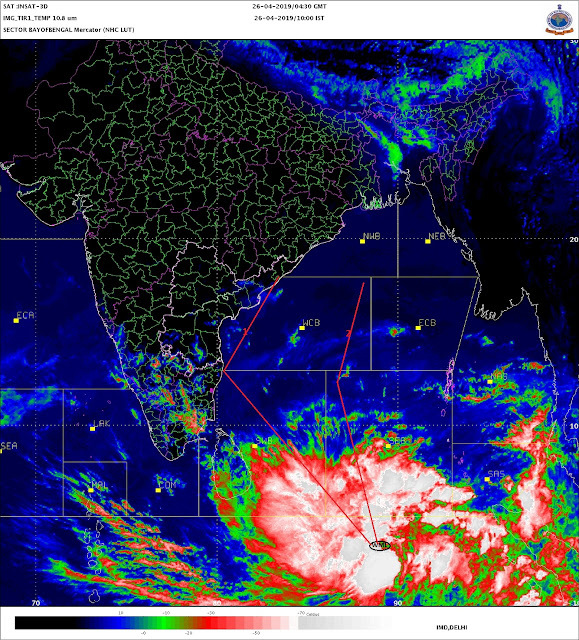 This could result in some heavy rains along the coast including Mumbai. Ron: Dont understand what low in the Bay are u and NT talking about? Never have mentioned abt any low yet in the Bay. In fact vagaries map showed a UAC 2 days back, and yesterday clarified that the UAC persisits, and may hang on for 2 more days. Forecasted rain to continue in T.N. on that basis. NT: There is No low over Saurashtra too. ok Ron. Working on putting up my views soon. Hey Rajesh, sorry for the confusion. What I meant was the UAC over Saurashtra / Kutch, as for the Low over BOB as Ron rightly mentions, the IMD did mention the likelyhood of a formation of the Low in the BOB, they suddenly removed it by their next bulletin (they removed any reference at all), hence I mentioned that in my comments - which were in the context of the latest IMD bulletin at that time. Will await your latest blog.